Detroit -- As car buyers look to buy quality cars for less money, Mini will benefit, said Vice President of Brand Management Wolfgang Armbrecht. "People want top quality but many want to go several steps back with their investment," Armbrecht said. "Mini benefits a lot from this trend." Mini's worldwide sales rose 4 percent last year to 232,000 units, but the entry-premium brand, which is owned by Germany's BMW, saw sales drop in the final months of the year. 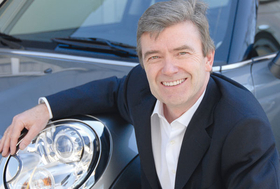 Armbrecht noted, however, that Mini sales outperformed the segment as a whole. Armbrecht didn't make a sales prediction for 2009, but said he wants to beat the automaker's 2008 results. He said that early indicators show the chances are good the goal will be met. -- Enhancing brand loyalty so Mini owners stick with Mini when they buy a new car.